Beets were first cultivated around the Mediterranean and Atlantic coasts of Europe, and eventually spread to all parts of the world, but were descended from the sea beet, a wild seashore plant of which only the leaves and stems were eaten. Now, we consume the entire vegetable; the leaves, stems, and the root itself. 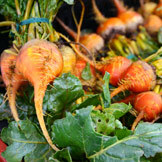 Several different of beets are commonly grown: the traditional red beet, the pink chioggia beet, and the yellow golden beet. They are also grown in several different sizes and shapes. When buying beets, it is important to inspect the root for a firm and solid surface. The leaves and stalks should also be hearty and cleaned with cool water before cooking and can be store in the fridge for up to 5 days. If the leaves start to go bad, they can be cut from the root, which will last for weeks in a cool place. There are many different ways to cook beets; their earthy flavor is nicely offset by vinegar, meaning they are commonly eaten cold in salads with vinaigrettes. Leaving their skin on while cooking will preserve the color. You can test its doneness by sticking a knife through the vegetable, near its cap, which should pierce easily, its skin, should also be easier to peel off when this vegetable is fully cooked.